Our team at Colette has decades of sewing experience—including patternmaking, production sewing, sample making, fitting, theater costuming, and design. Every Tuesday we send helpful sewing tips straight to your inbox—for free! 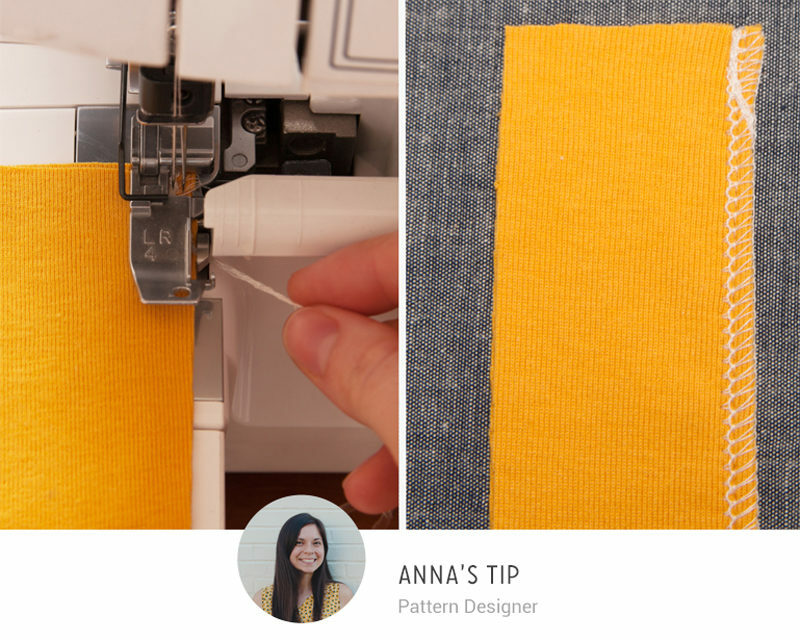 Over the years, we have picked up tons of tips and tricks that make sewing fun and easy. Here are some of our favorite Snippets from 2016. Your measuring tape has been keeping a secret! We use our flexible measuring tapes for all kinds of things in the sewing room, and now you’ve got one more reason to keep this guy draped around your neck. Most measuring tapes are 5/8″ wide, which is very convenient considering it is also the most common seam allowance for commercial patterns. 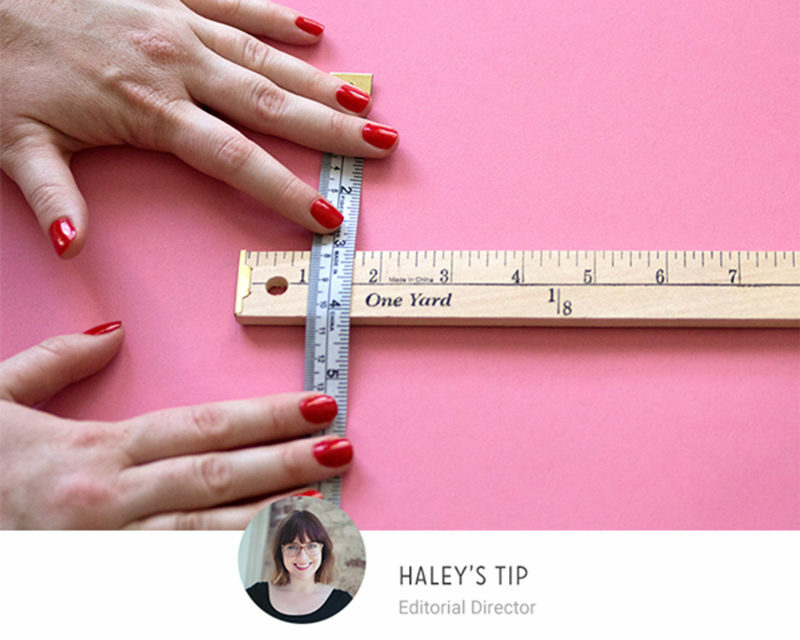 Next time you’re not sure if a seam is sewn at the right seam allowance, or when you’re adding seam allowance after alterations, just grab your measuring tape! Have you ever accidentally sliced your fabric when trying to cut open a buttonhole with your seam ripper? If so, you know how disheartening this buttonhole blooper can be. Instead of buying a buttonhole cutter, try using pins! Mark the beginning and end of your buttonhole with pins to stop your seam ripper from slicing through your fabric and stitches. Who doesn’t love using a fresh piece of tailor’s chalk? Keep your chalk collection at its sharpest with a common kitchen tool: a potato peeler. Use the potato peeler to sharpen each edge of your chalk. The peeler allows you to create the chalk shape that works best for you and your project. Tip: This will create dust, so sharpen your chalk over a trash can or sink, and be sure to wash your peeler with soap and water before using it again for potatoes! If you want your favorite pattern pieces to last for years and look beautiful all at the same time, use oilcloth! You can easily trace your pattern pieces on the back of oilcloth—including any pattern markings—and use the pieces over and over without any risk of tearing. Oilcloth stores well rolled or flat, and it will give you something pretty to look at as you cut out your fabric. If you’ve ever looked closely at a needle package, you might have noticed there are a couple sets of numbers. But what do they mean? The second set of numbers on the needle package indicates the size. The lighter the needle, the lower the number (75). The first number (100, 90, 80, and 75) is the European measurement. The second number listed, (16, 14, and 12) are US measurements. Some refer to machine needles as “90/14s” and others call them “14s,” both are correct! Use an old silicone wristband from a recent athletic event. If you still have an original Livestrong bracelet, give it a whole new life on your machine. Place a stack of sticky notes on your machine’s arm (they also come in handy for jotting down any brilliant ideas you have while sewing). Washi tape or masking tape make great removable markers. There are multiple ways to prevent serger tails from unraveling over time, and this technique is our favorite. To start, stitch a few stitches, then with your needles down, lift the presser foot and bring your tail to the front of the machine. Make sure to place the tail to the right of the foot so that the knife catches it and cuts it off. All you need to do now is serge on! 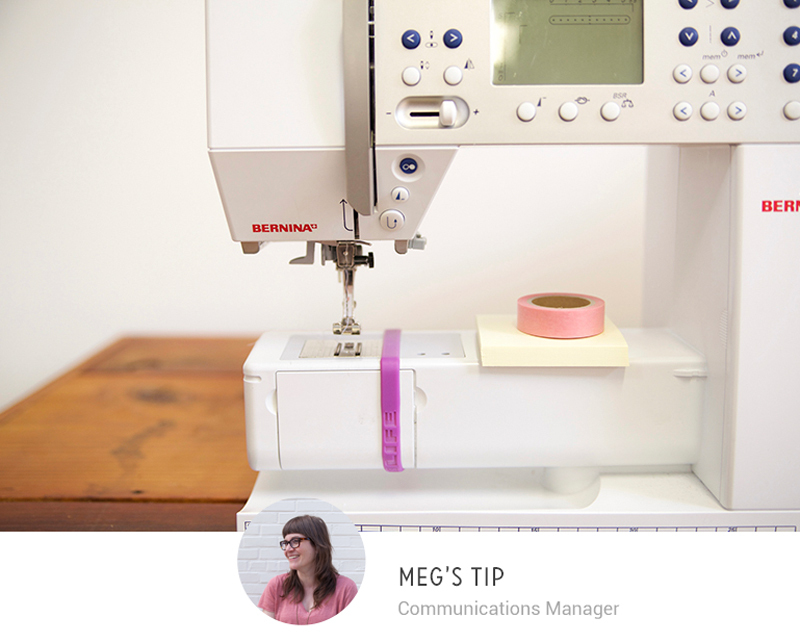 Do you have trouble keeping track of your machine needles between projects? Make a customized pin cushion! 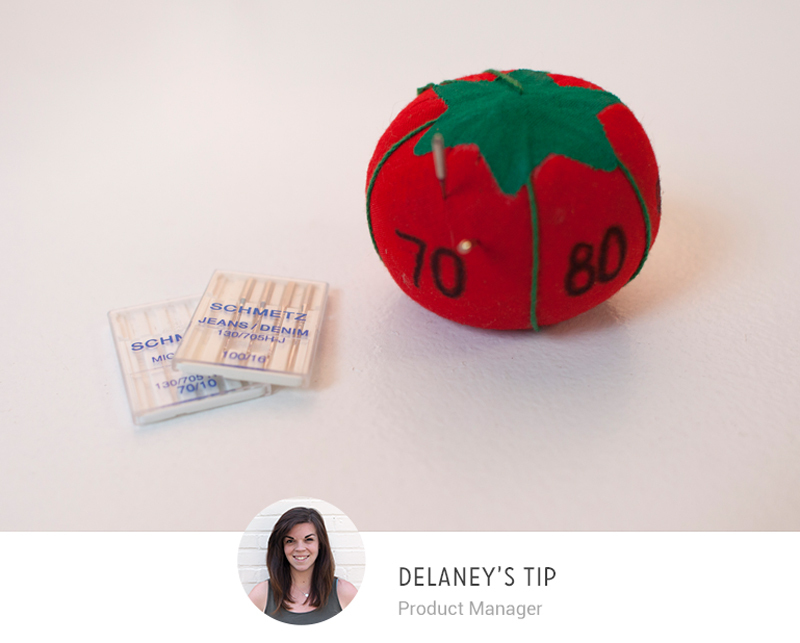 Start with a classic tomato pin cushion. 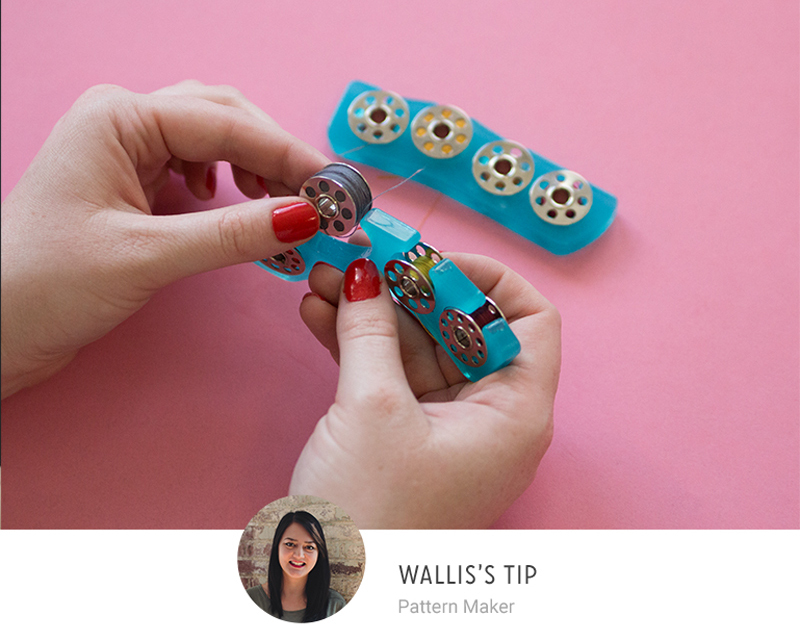 Use a sharpie to divide it into different sections to organize your needles between projects. Another great thing about this tomato is that it is portable. Now you can carry a variety of needles all in one place when you sew on the go! Here’s one of those quick-and-easy tips that will make your sewing experience much more enjoyable! Toe separators happen to be the perfect size for bobbins. Bobbins slide right in and the tension of the toe separator keeps them in place. If you’ve got some extra thread still poking out, just rotate the bobbin until it’s neatly tucked away. Why rack your brain trying to fold your pattern pieces perfectly back to the way they came? Do your future-self a favor and press your pattern pieces after cutting your fabric. 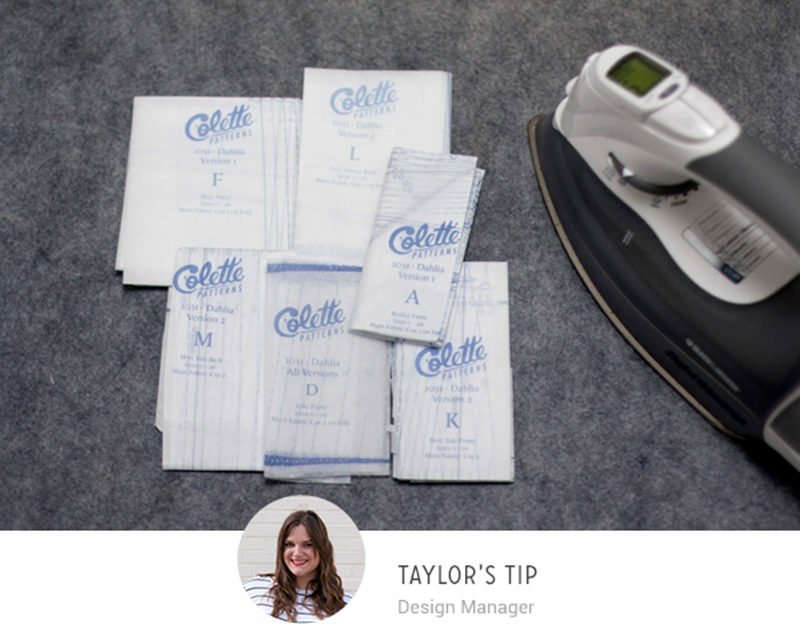 Tissue and printer paper can hold up to the heat of an iron, just make sure to turn off your steam. You can also bring organization to a whole new level by folding your pieces with the pattern name and information facing up. 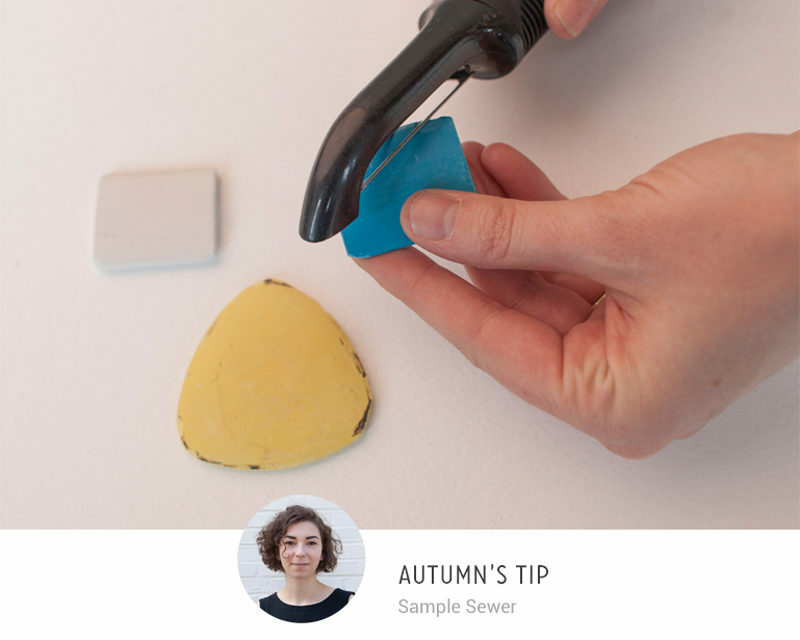 No more digging through pattern envelopes for you! Happy New Year from all of us at Colette Media. Thank you for your continued support and for helping us revive the art of sewing for another year! See you all in 2017! I love all of these, you guys are the best! I particularly like the bobbin storage tips, including the magnetic knife boards mentioned recently. They are on my post Christmas shopping list. And the potato peeler has a completely different appeal now. Keep up the wonderful tips please! I’m a nerd and iron my pattern pieces so they are all the same size, using a template to fold around. I store patterns in comic book envelopes so I always want to ensure they fit and use up the space efficiently. What are comic book envelopes? Great idea! I never thought of using comic book sleeves and boxes to store my growing pattern collection! I have been sewing for 60 years yet Collette often teaches me new things. I never knew that my tape was the width as a seam allowance or the number on needles that indicated for home sewing. Keep the tips coming please. Brilliant ideas! I love the needles in the tomato idea! And the toe separaters! And serving over tail threads! And…And…well, just love Snippets! Thank you! These are great tips! I especially love the tomato pin cushion to organize needles! “Sew” very nice of you! Thank you team Collette! I use cheap Pellon 808 to interface my pattern master copies, then trace off that. Keep in mind to leave room around each piece for ease of tracing. Also, if I’ve got my size, I trace over tissue pieces with a think sharpie over oak tag or poster board. Make sure to transfer markings! Now, you’ve got a permanent pattern to make your garments from! 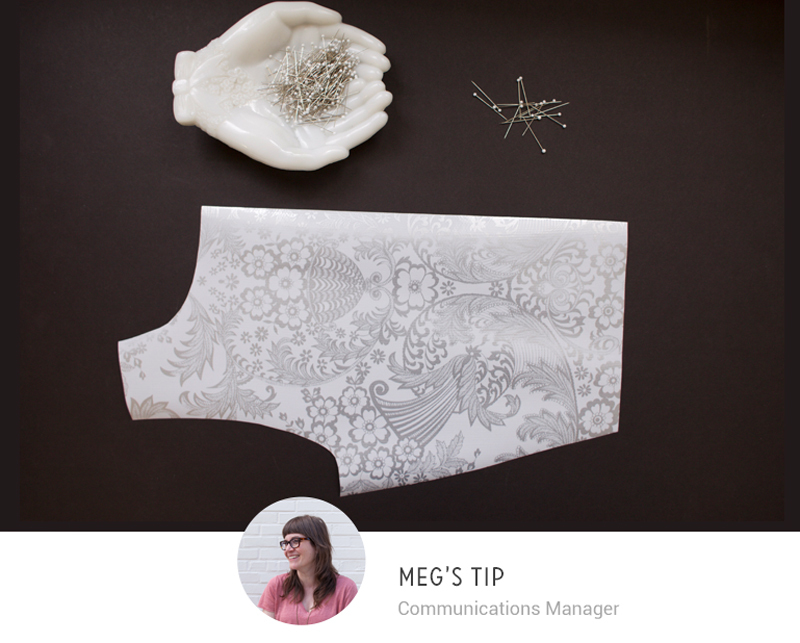 The oil cloth pattern preservation tip would be even better if your shape didn’t change every 5 minutes! I wouldn’t count on them lasting for “years” – months, maybe, but even that is a stretch!! how to sharpen chalk, EPIC! So nice to share tips with others who love to sew. I certainly will put a number of these into practice. I just love the tip about storing needles in a pin cushion marked with sizes/needle type/hours used etc. As I am pretty new to sewing, I’m still learning what needle to use with what material and I’ve ended up with some stray needles and have no idea what they are or how long they have been used. 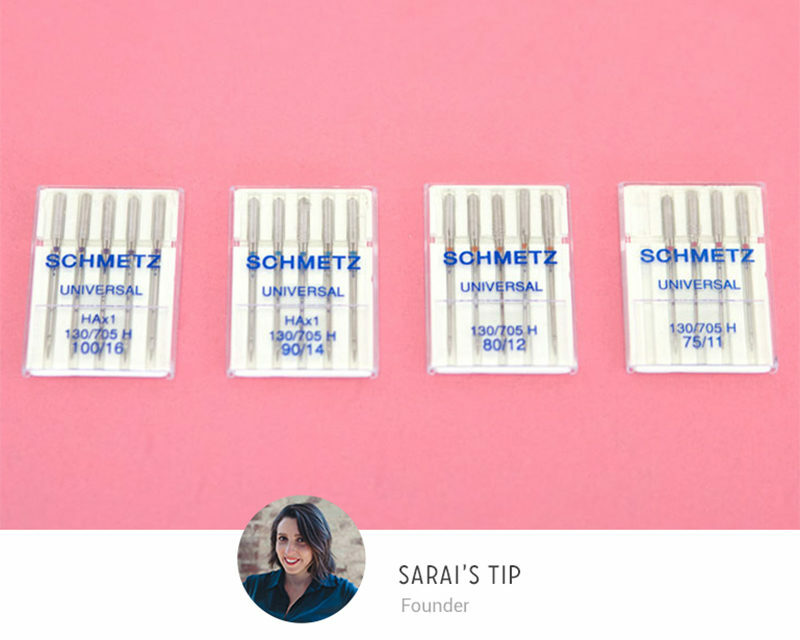 I do try now to pop the needles back in their cases so I know what they are – but this is such a brilliant idea and will certainly keep me better organized in the future. Thank you for sharing this.